Flowering plant development is wholly reliant on growth from meristems, which contain totipotent cells that give rise to all post-embryonic organs in the plant. Plants are uniquely able to alter their development throughout their lifespan through the generation of new organs in response to external signals. To identify genes that regulate meristem-based growth, we considered homologues of Raptor proteins, which regulate cell growth in response to nutrients in yeast and metazoans as part of a signaling complex with the target of rapamycin (TOR) kinase. We identified AtRaptor1A and AtRaptor1B, two loci predicted to encode Raptor proteins in Arabidopsis. 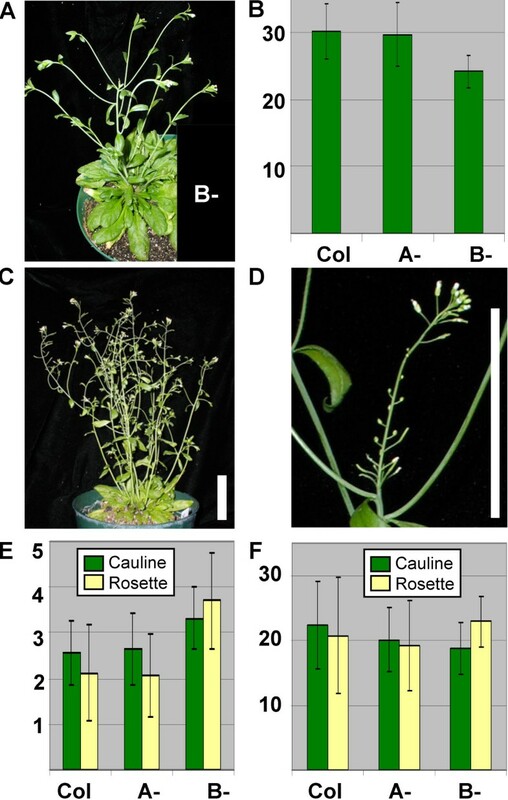 Disruption of AtRaptor1B yields plants with a wide range of developmental defects: roots are thick and grow slowly, leaf initiation and bolting are delayed and the shoot inflorescence shows reduced apical dominance. AtRaptor1A AtRaptor1B double mutants show normal embryonic development but are unable to maintain post-embryonic meristem-driven growth. AtRaptor transcripts accumulate in dividing and expanding cells and tissues. The data implicate the TOR signaling pathway, a major regulator of cell growth in yeast and metazoans, in the maintenance of growth from the shoot apical meristem in plants. These results provide insights into the ways in which TOR/Raptor signaling has been adapted to regulate plant growth and development, and indicate that in plants, as in other eukaryotes, there is some Raptor-independent TOR activity. Plant development is remarkably plastic. Groups of totipotent cells termed meristems, which are maintained throughout the life of the plant, give rise to all post-embryonic organs from roots and leaves to petals and fruit. This allows plants, unlike metazoans, to change their final body plans dramatically in response to environmental, hormonal and nutritional cues. While much has been learned about the determination of cell fates in the embryo  and the apical meristems [2–4], less is known about the genes that control the growth that occurs in cells emerging from the plant meristem. TOR proteins were originally identified in budding yeast as the targets of rapamycin, a potent antibiotic that disrupts cell growth [5, 6]. In both yeast and metazoans, TOR proteins mediate translation in response to nutrients . Yeast TOR2 and mammalian mTOR also regulate cytoskeletal organization [8–13]. In both yeast and mammalian cells, TOR proteins form a complex, TORC1, with GβL  and Raptor (regulatory associated protein of TOR) [15–17]; their yeast homologues are LST8 and KOG1, respectively . Raptor contains protein-binding domains, and the Raptor N-terminus shows similarity to a caspase domain , though catalytic activity has yet to be shown. It has been reported that the strength of the TOR-Raptor interaction is regulated by nutrients, though there is not yet consensus on this point [15–17]. Raptor functions in TORC1 to recruit substrates for phosphorylation by TOR; Raptor binds TOR substrates S6kinase and eIF4E-BP, and is necessary for full TOR phosphorylation of these substrates in vitro [16, 19]. The TOR-Raptor complex is thought to mediate the nutrient-sensitive regulation of cell growth; mutants in yeast lacking a functional complex cease cell growth in a manner that mimics rapamycin treatment . A second TOR complex, TORC2, involves GβL, Rictor (rapamycin-insensitive companion to TOR) and perhaps other proteins [13, 17, 20]. This complex is unaffected by rapamycin, and is thought to mediate TOR cytoskeletal regulation. In Arabidopsis the single TOR homologue, AtTOR, is critical for plant development [21, 22]. AtTOR insertion homozygote embryos undergo cell division but are unable to gain cell volume or undergo apical-basal differentiation. Although AtTOR transcripts accumulate in all tissues assayed , an AtTOR-Gus fusion transcript is only translated in meristematic tissue and the immediately adjacent expanding cells . A TOR-specific microRNA conserved between Arabidopsis and rice  implicates post-transcriptional regulation in AtTOR expression. Rapamycin perturbs the activity of the nutrient-sensitive TOR complex in yeast and mammals. Arabidopsis, however, is insensitive to rapamycin,  precluding this approach to the elucidation of Arabidopsis TOR signaling. Here we report a characterization of AtRaptor1A and AtRaptor1B, which encode the two Arabidopsis Raptor homologues. We found defects in both root and shoot growth in AtRaptor1B disruption lines, resulting in slow leaf initiation, late flowering and increased branching. We also found that AtRaptor1A AtRaptor1B double mutant homozygotes undergo normal seedling development, but exhibit only minimal post-embryonic meristem activity. We contrast these results with those found previously for the AtTOR mutant, and discuss the implications of this work for TOR signaling in plants. To search for plant homologues of mammalian Raptor, we surveyed the completed Arabidopsis genome and found two loci that might encode proteins highly similar to Raptor at the north ends of chromosomes 3 and 5. We did not find an expressed sequence tag (EST) for the first locus (AtRaptor1A; At5g01770). However, we used the 5'-rapid amplification of cDNA ends (RACE) to establish that the locus is transcribed to an mRNA with a 5' end consistent with the predicted open reading frame (ORF) of AtRaptor1A. The AtRaptor1A protein is predicted to be 1,346 amino acids in length. The second locus (AtRaptor1B; At3g08850) was represented by a single EST (accession no. AY769948). We used 5' RACE to confirm that the EST contained the full ORF of AtRaptor1B. The AtRaptor1B locus is transcribed to a 4.8 kb mRNA containing 23 exons, and the protein is predicted to be 1,344 amino acids in length. Predicted AtRaptor1A and AtRaptor1B proteins show 80% identity over their entirety. To determine the time of divergence between the two AtRaptor loci, we searched for Raptor homologues in available plant genome data using AtRaptor1A and AtRaptor1B as query sequences. Full-length Raptor loci were discovered in the available rice (Oryza sativa subspecies japonica) and alfalfa (Medicago truncatula) genome sequences. Using AtRaptor1B and partial cDNA sequence (where available) as guides, we determined putative protein sequences from these loci. Alignment of these sequences with AtRaptor1A, AtRaptor1B, mammalian Raptor, the budding yeast Raptor homologue KOG1 and the fission yeast Raptor homologue Mip1p showed that there is a striking degree of conservation among all Raptor homologues (Fig. 1A; for the complete alignment [see additional file 1]). AtRaptor1B and the Saccharomyces cereviseae Raptor homologue KOG1, the most divergent member included in the analysis, show 28% identity throughout their length. All plant Raptor homologues encode the Raptor N-terminal Conserved / Caspase (RNC/C) motif, HEAT repeats and WD40 motifs first identified in fission yeast Mip1 and characteristic of all Raptor proteins [25, 26](Fig. 1B). From this alignment we generated a phylogeny of the Raptor homologues (Fig. 1C). The predicted AtRaptor proteins resolve to a single clade with a high degree of confidence, indicating that the duplication of the AtRaptor loci post-dates the divergence of Arabidopsis from Medicago, and that the loci are likely to encode functionally redundant proteins. Raptor proteins in eukaryotes are highly conserved. (A) Similarity plot of Raptor homologues from the vascular plants Arabidopsis, Medicago truncatula and Oryza sativa, the fungus S. pombe (Mip1p), and mammals. The X-axis represents residue number; the Y-axis represents percent identity at that residue from 0% (0) to 100% (1). 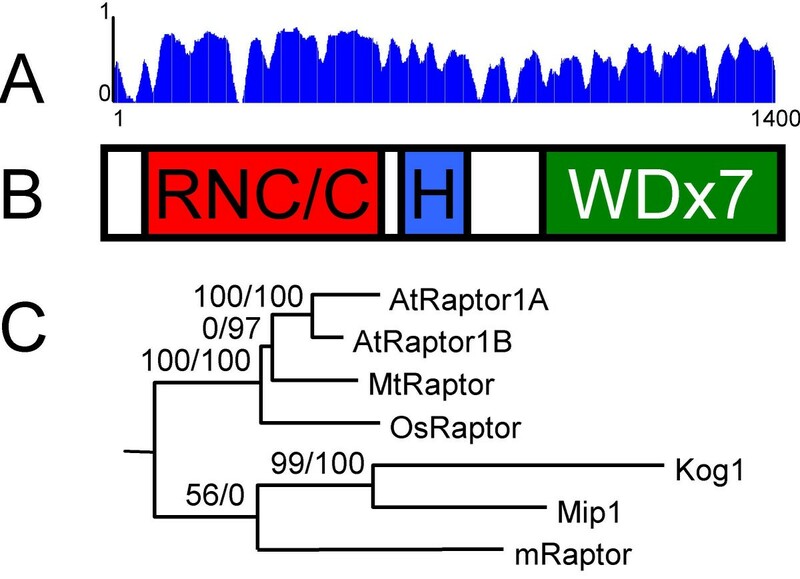 (B) Schematic diagram showing the position of the Raptor N-terminal Conserved / putative Caspase domain (RNC/C) region, HEAT repeats (H), and WD-40 repeats (WDx7) common to all Raptor proteins. (C) Phylogeny of plant, animal and fungal Raptor proteins. Bootstrap values, calculated using both parsimony (left) and maximum likelihood (right) are shown to the left of the clades they describe. The two Arabidopsis Raptor proteins, AtRaptor1A and AtRaptor1B, resolve as a single clade with 100% confidence. The alignment was generated using Megalign (DNAStar), the similarity plot was generated from this alignment using VectorNTI, and bootstrap values were calculated using PAUP*4.0b. To gain insight into the function of the AtRaptor proteins, we searched for insertion alleles of each locus among the publicly available sequenced T-DNA insertion lines. Insertion mutant lines SALK_043920 and SALK_078159, with disruptions to the AtRaptor1A and AtRaptor1B loci, were obtained from the Arabidopsis Biological Resource Center (USA). Lines homozygous for each insertion (referred to as 1A -/- and 1B -/-, respectively) were identified via polymerase chain reaction (PCR), and RNA from floral buds of insertion homozygotes was used for reverse-transcriptase-PCR (RT-PCR) to assay for accumulation of wild-type transcripts from the disrupted locus. AtRaptor1A transcripts could not be detected in 1A -/- buds, but were detected in 1B -/- buds. AtRaptor1B transcripts were not detected in 1B -/- buds, but were detected in 1A -/- buds. Both transcripts were detected in wild-type Columbia (Col) buds (Fig. 2). AtRaptor loci and insertion allele characterization. (A) AtRaptor1A and AtRaptor1B loci. Genomic sequence is depicted as a thin central line. Thick blocks indicate exons. Coding exons span the central line; exons encoding untranslated regions are fully below the central line. The positions of the T-DNA insertions are depicted with inverted triangles. (B) Reverse-Transcribed RNA-template Polymerase Chain Reactions (RT-PCR) on plants homozygous for both wild-type AtRaptor alleles (Col), the AtRaptor1A insertion allele (A-) or the AtRaptor1B insertion allele (B-), using primers spanning the AtRaptor1A insertion site, the AtRaptor1B insertion site, or control primers. Both AtRaptor insertion alleles abolish accumulation of the wild-type transcript from their locus. As a first step toward characterizing these mutant lines, Col, 1A-/- and 1B-/- seedlings were germinated on culture medium. Col and 1A-/- seedlings were phenotypically indistinguishable. However, B-/- seedlings showed distinct root growth defects: roots were thick, coiled and densely covered with hairs, and the roots had difficulty penetrating the medium (Fig. 3A). Plate-grown 1B -/- seedlings were repeatedly shorter than Col or 1A-/- seedlings. Although dark grown 1B-/- seedlings were also shorter than Col or 1A-/-, the difference in size was much less (Fig. 3B). While dark-grown etiolated seedlings grow primarily through the expansion and division of embryonic hypocotyl cells, light-grown seedlings grow primarily through the production of cells from the root apical meristem. Thus the difference in size between Col, 1A-/- and 1B-/- seedlings results primarily from a reduction in root apical meristem growth rather than a general defect in cell expansion or metabolism. Seedling root phenotype of AtRaptor1B -/- (B-) mutants. (A), (B). Col and B- seedlings on growth medium, four days after germination. The B- root has not penetrated the medium and is thick, hairy and coiled. (C) Col, A- and B- seedlings at 8 days after germination in light. Scale bar is in mm. (D) Same genotypes and age as C, grown in the dark. (E) Measurements of populations grown as in C, D. Root length is indicated in tan; shoot length is dark green. (F) B- and Col seedlings grown on vertical plates for 12 days, and then returned to horizontal growth for three days. B- roots are thin, straight and hairless on vertical plates (compare to 3B), and revert to coiled growth only in tissue generated after being placed horizontally. (G) Quantification of results in (F). B- seedlings grown on vertical plates are intermediate in length between flat-grown B- seedlings and Col seedlings. (H), (I) Col and B- root tips, viewed under bright field microscopy. Scale bar = 100 μm. B- root tips contain all the cell types seen in Col root tips, but the overall morphology is blunt and rounded compared to Col. The roots of 1B-/- seedlings grown on 90° inclined plates were morphologically wild type but shorter than Col roots. When the plates were rotated to lay flat horizontally, new growth from the root apex of 1B-/- seedlings produced thick, coiled roots (though the roots were not densely covered in hairs), while the previously produced root tissue remained morphologically wild type (Fig. 3C). Only those sections of the root not in contact with the medium were hairy (Fig. 3A). Thus the root growth disturbance was a defect in growth into agar rather than in gravitropism, though in the absence of resistance, roots still grew more slowly than wild type. Col and 1B-/- root apical meristems (RAM) were examined using bright-field microscopy (Fig. 3I). 1B-/- seedling RAMs contained all cell types present in Col RAMs but their root morphology was much more blunt; this difference appeared to be localized to the 1B-/- zone of elongation. 1B-/- root tips showed a tendency to shed their root caps, although shedding was sometimes observed in Col root tips as well. To measure developmental defects resulting from AtRaptor insertions, we grew Col, 1A-/- and 1B-/- lines on soil, and scored their rates of leaf initiation, time to floral bud initiation, rate of cauline leaf initiation, time to flowering and number of floral shoot apices. 1B-/- plants were smaller, had a slower rate of leaf initiation, and bolted and flowered later than did Col or 1A-/- plants (Fig. 4A–C). AtRaptor1B -/- plants grow slowly. (A), (B) Col and B- plants at 15 days after germination on soil. (C) B- plants bolt later than Col or A-. Shown are shoots from plants 1 month after germination. (D) Growth curve of Col, A- and B- plants. The X-axis represents time after production of the first leaf. The Y-axis represents the number of rosette leaves up to 11; presence of a floral bud is 12; number of cauline leaves plus 12 is 13–16, and values above 16 are the number of shoot apices harboring flowers plus 15. B- plants show slower leaf initiation, later bolting (though at a similar rosette leaf number as Col and A-) and later flowering. Mature 1B-/- plants were conspicuously bushier than Col or 1A-/- homozygotes (Fig. 5). The primary shoot apex was shorter than that of Col plants and ended prematurely in a terminal inflorescence of infertile flowers. The growth of the plant was then taken over by axillary shoots and by secondary shoots from the basal rosette. AtRaptor1B -/- plants show altered shoot architecture. (A) B- plant at flowering. The primary shoot apex, center, has ceased growth and is surpassed by axillary branches. Compare to Col, A- in 3C. (B) Col, A- and B- primary shoot length. (C) Mature B- plant, showing a bushy phenotype due to decreased primary shoot growth and increased branching. (D) Shoot apex of the plant in C, magnified 4.5×. Axillary branches outgrow the primary shoot, which arrests in a whorl of sterile flowers. (E) Col, A- and B- cauline and rosette branch number. (F) Col, A- and B- cauline and rosette branch length. B- primary shoots are smaller than Col or A-, and secondary shoots initiate more frequently than Col or A- but are not significantly longer than Col or A-. To quantify this phenotype, Col and 1B-/- lines were grown to maturity in 16-hr days, and shoot architecture for an individual plant was scored at the shattering of the first silique. 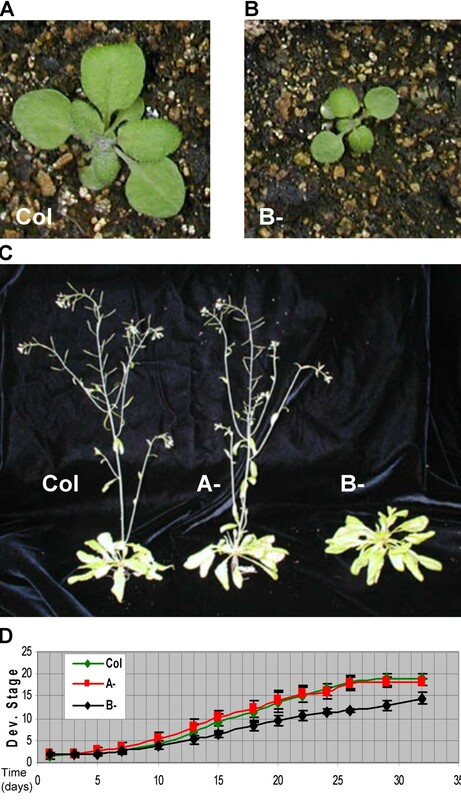 1B-/- plants showed reduced shoot height, reduced primary stem length, increased axillary branch number and an increased number of secondary shoots compared to Col and 1A-/- plants (Fig. 5B, E). 1B-/- branch numbers, though variable, were significantly larger than those of wild type or 1A-/-. Student's t-Tests of sample pairs assuming equal variance yielded P-values of 0.0027 and 0.0004 for 1B-/- vs. Col and 1B-/- vs. 1A-/- axillary branch number, respectively, and 0.0026 and 0.0013 for 1B-/- vs. Col and 1B-/- vs. 1A-/- secondary shoot number. Axillary branch length did not differ significantly from Col values (Fig. 5F). This phenotype became more pronounced later in plant development and was more conspicuous under short days. To confirm that the collection of phenotypes observed in the AtRaptor1B-/- homozygotes was due to the mutant 1B allele, 1B-/- plants were transformed with a construct containing the AtRaptor1B ORF and 5' UTR and driven by the AtRaptor1B promoter. Some of these transformants showed wild-type transition to bolting, shoot branching and root growth (data not shown). We conclude that the 1B-/- phenotypes described above result from homozygosity for the lesion at the AtRaptor1B locus. A combination of in situ RNA hybridization and in silico expression analysis was used to determine the RNA accumulation pattern of AtRaptor transcripts in Arabidopsis. The AtRaptor1B cDNA sequence was used to generate an AtRaptor probe to assay transcript accumulation in the shoot tips of wild-type plants. Since AtRaptor1A and AtRaptor1B show 80% identity through the length of their transcripts, this probe likely detected expression of both loci.AtRaptor transcripts were detected throughout the shoot tip, in all organs of the differentiating floral bud, and deep into the differentiated inflorescence stem (Fig. 6A). Signal intensity faded with the distance from the shoot apex. This accumulation pattern differed from that of actin (Fig. 6B), which was more prominent in dividing cells of the apex. Notably, AtRaptor accumulation is not restricted to the primary shoot apex. AtRaptor accumulation pattern. (A) AtRaptor transcripts accumulate throughout the floral shoot apex, stem and differentiating floral buds. Accumulation is not confined to dividing or meristematic cells, but fades in intensity away from the apex. (B) Adjacent tissue slice, probed with actin. AtRaptor and actin transcript accumulation patterns differ. (C) In silico analysis of AtRaptor1A (left) and AtRaptor1B (right) accumulation from 1434 developmental gene chip experiments. Results are given by developmental stage (X-axis) and in terms of gene chip-normalized expression levels (Y-axis). Expression levels are shown to scale. Developmental stages are as follows: 1, 1.0–5.9 days; 2, 6.0–13.9 days; 3, 14.0–17.9 days; 4, 18.0–20.9 days; 5, 21.0–24.9 days; 6, 25.0–28.9 days; 7, 29.0–35.9 days; 8, 36.0–44.9 days; 9, 45.0–50.0 days. Analyses performed via the genevestigator website https://www.genevestigator.ethz.ch. To obtain an estimate of the relative levels of AtRaptor1A and AtRaptor1B in the signal seen in Fig. 6A, AtRaptor1A and AtRaptor1B locus IDs were used to query the Genevestigator Arabidopsis thaliana Microarray Database and Analysis Toolbox . AtRaptor1A and AtRaptor1B accumulate in all developmental stages (Fig. 6C). However, AtRaptor1B accumulation levels are consistently fourfold higher than those of AtRaptor1A. A second analysis of accumulation by tissue rather than developmental stage produced similar results. We conclude that AtRaptor1A and AtRaptor1B show similar expression patterns. The high degree of similarity between AtRaptor1A and AtRaptor1B led us to suspect that they may be at least partially functionally redundant. To eliminate all AtRaptor activity in a single line, 1A-/- and 1B-/- lines were crossed. No 1A-/- 1B-/- plants could be identified among the F2 of this cross on soil. Phenotypically wild-type 1A-/- 1B+/- plants were identified via PCR using the primer pairs described in Materials and Methods and their progeny (205 seedlings) were examined on agar plates. Of these, 165 seedlings (80%) appeared wild type (Fig. 7A). It was determined by PCR that these seedlings carried a wild-type 1B allele (32/32 tested). The remaining seedlings (40/205; 20%) germinated but showed minimal postembryonic shoot meristem growth (Fig. 7A). It was determined by PCR that these seedlings were genetically 1A-/- 1B-/- (32/32 tested). This genotyping confirmed that the seedling arrest mutant phenotype co-segregated with homozygosity for the AtRaptor1B mutant allele in the AtRaptor1A mutant background. We concluded that this seedling phenotype corresponded to the 1A-/- 1B-/- double mutant. AtRaptor1A -/- 1B -/- double mutants. (A) Col, A-, B- and A-B- seedlings at seven days on growth medium with no sucrose. (B) 1A-/- 1B+/- progeny germinated on growth medium supplemented with 0%, 1% or 6% sucrose. Shown for each treatment is an A-B- seedling and an A-/- B+ sibling. A-B- seedlings on 1% sucrose show significant root growth and minimal leaf buds. Scale bar for A, B = 5 mm. (C) Quantification of results in (B). (D) A-B- root tips grown on 1% sucrose lack an epidermal cell layer. (E) A-B- roots form root hairs on 1% sucrose. Scale bar = 100 μm. Compare to 3H, I. (F, G, H, I) Scanning electron microscopy on Col, A-B- shoot apices from growth medium plates. As in (B), A-B- seedlings show minimal (SAM) activity. Primordia for leaves 1 and 2 form but do not expand significantly. Scale bar = 50 μm (F, G) or 15 μm (H, I). We examined 1A-/- 1B-/- double mutant seedling roots via bright field microscopy to ascertain the extent of their post-embryonic growth defect. 1A-/- 1B-/- roots were conspicuously narrower than wild type. The columella, quiescent center, vasculature, pericycle, endodermis and cortex are present though all smaller than wild type; the outer layer of cells is difficult to identify. Further up the root, root hairs were clearly visible, indicating that the RAM had produced some mature root cell types (Fig. 7D, E). To gain a better understanding of the double mutant shoot apical meristem (SAM) defect, Col and 1A-/- 1B-/- 7-day seedlings were fixed and coated, and their shoot apexes were observed with a scanning electron microscope. In Col seedlings, leaves 1 and 2, with trichomes, were clearly visible; primordia for leaves 3, 4 and 5 were visible under higher magnification. 1A-/- 1B-/- shoot apexes showed minimal SAM activity: leaves 1 and 2 were produced, but were smaller than wild type and did not separate to reveal any further leaf primordia (Fig. 7F, G, H, I). In order to determine whether a plant hormone or signaling molecule could restore post-embryonic growth to these arrested seedlings, progeny of 1A-/- 1B+/- individuals were germinated on plates containing a variety of plant hormones and signaling molecules and scored for their total seedling lengths at 10 days post germination. Signaling molecules tested included the gibberellin GA3 (100 nM to 10 μM), abscisic acid (100 nM to 10 μM), the auxin 2,4-D (1 nM to 10 μM), the ethylene precursor ACC (1 μM and 10 μM), sucrose (1%) and glucose (6%). We also attempted dark treatment. None of these treatments restored wild-type SAM growth to the quarter of the progeny showing seedling arrest. 1A-/- 1B-/- seedlings did show a significant response to sucrose (Fig. 7B, C). Addition of 1% sucrose, which is a growth signaling factor as well as a carbon source , to the growth medium promoted growth in Col, 1A-/-, 1B-/- and 1A-/- 1B-/-. In sibling seedlings, the addition of sucrose elicited a twofold increase in seedling length; in the double mutants the increase was five-fold. Germination on 6% sucrose, which signals growth arrest in Col plants , yielded sibling plants 1–1.5× the size of seedlings grown on 1/2 Murashige & Skoog (MS) salts with no sucrose added. 1A-/- 1B-/- seedlings on 6% sucrose were 2.3× the length of those grown on 1/2 MS salts. A similar result was observed among 1A-/- 1B+/- progeny germinated in the dark on 1/2 MS salts plates, and the length of 1A-/- 1B-/- seedlings was increased more than 3× under these conditions. The absolute length of the double mutant seedlings was in all cases still substantially smaller that that of sibling seedlings for a given treatment, and the increase in length was largely due to hypocotyl elongation or root growth. Minimal SAM activity was observed. Axillary branch growth in Arabidopsis and other vascular plants is governed indirectly by auxin produced at the primary shoot apex, which acts through an undetermined secondary messenger to repress axillary meristem growth . The shoot morphology of 1B-/- plants indicates a defect in primary SAM maintenance. The primary shoot is shorter than wild type and ends in a whorl of sterile flowers. The number and length of axillary shoots, both cauline and emerging from the basal rosette, is significantly increased. Notably, axillary meristems are quite viable, producing branches as long as or longer than wild type. 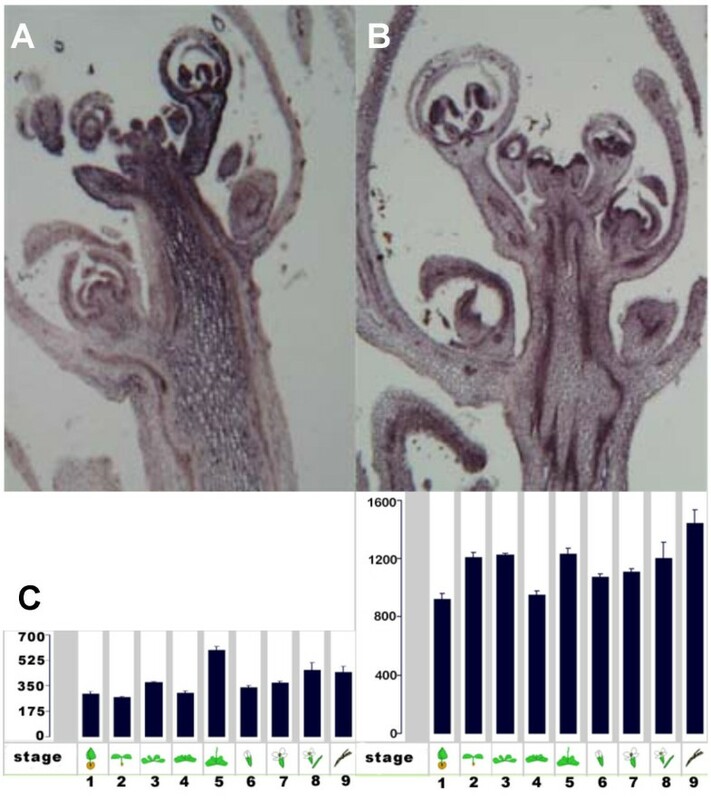 The viability of axillary shoot apices points to a failure to maintain primary SAM activity, and a subsequent failure to repress axillary meristem activity. This defect is not shared by the axillary SAMs, which match or surpass the activity of their wild-type counterparts. A similar phenomenon is seen in erecta mutants  and may be quite common. The increased branching in AtRaptor1B mutant plants may result directly from reduced auxin production at the shoot apex or from a change in the auxin/cytokinin ratio. However, 1B-/- mutants did not show defects in their ability to sense exogenous auxin (data not shown). The endogenous AtRaptor1A locus cannot fully complement the disruption of AtRaptor1B despite the fact that their predicted proteins are 80% identical, share all conserved Raptor motifs and strongly resolve to a single clade in phylogenetic analysis. In silico analysis suggests that the failure of AtRaptor1A to mask AtRaptor1B lesions may be due to lower levels of AtRaptor1A expression globally rather than limited tissue-specific accumulation of AtRaptor1A. We did not assay for the complementation of AtRaptor1B lesions by transforming AtRaptor1B-/- plants with an AtRaptor1A construct. In contrast, AtRaptor1B can fully complement the loss of AtRaptor1A expression; indeed, a single wild-type AtRaptor1B allele in 1A-/- 1B+/- plants is sufficient for wild-type growth. Our ability to isolate AtRaptor1B mutant homozygotes conflicts with a recent report . In that report, mutants homozygous for AtRaptor1B disruptions were lethal at or before the first asymmetric embryonic division, which is even earlier than the lethality of AtTOR mutant homozygotes. We are uncertain of the reason for the discrepancy in these results. We are able to recover 1B-/- plants, but Deprost et al. , working with the same AtRaptor1B allele (SALK_043920), described them as embryo-lethal. One possible explanation might be a variation in growth conditions, which could lead to a higher degree of stress on developing embryos in the experiments by Deprost et al. The fact that these authors observed some embryo arrest in wild type control lines supports this possibility. Disruption of AtRaptor1A yielded no significant phenotype in either our growth conditions or those of the previous report . Simultaneous disruption of both AtRaptor loci resulted in growth-arrested seedlings, which undergo normal embryonic organogenesis but are unable to maintain post-embryonic growth from their SAMs. AtRaptor1A-/- AtRaptor1B-/- double mutants' SAMs cease activity after the production of a few leaf primordia. We conclude that AtRaptor activity is essential for the maintenance of SAM activity, but not for SAM assembly or for the initiation of SAM activity. Our results indicate that AtRaptor activity is not essential for embryonic organogenesis. In contrast, AtTOR-/- mutants arrest development early in embryogenesis . The disparity between the AtRaptor1A-/- 1B-/- and the AtTOR-/-phenotypes indicates that AtTOR activity in embryonic development does not require AtRaptor. Thus if AtTOR is acting in a complex in embryonic development, this complex does not require AtRaptor. In both yeast and mammalian cells, TOR functions in two distinct complexes (Fig. 8A). The first of these, TORC1, involves Raptor and regulates cell growth and translation in response to nutrients [14–17]. The second of these complexes, TORC2, regulates cytoskeletal organization and does not involve Raptor [13, 17, 20]. TOR functions in two complexes in eukaryotes. (A) TOR participates in two complexes in yeast and mammals. The first of these, TORC1, regulates cell growth in response to nutrient and hormonal signals. Raptor is integral for TORC1 activity. The second of these, TORC2, regulates cytoskeletal organization. Its activity is nutrient-independent, and Raptor is not a component of TORC2. (B) Model of TOR function in plants. Embryonic development is indicated by the single horizontal arrow from zygote to seedling; meristem-driven post-embryonic development is indicated by the arrows emanating from the seedling root and shoot apices. TOR, acting independent of Raptor in a putative complex homologous to yeast and mammalian TORC2, is essential for embryonic development. TOR via TORC2 may play a role in post-embryonic development as well; the embryonic lethal AtTOR knockout phenotype precludes a definitive answer on this point. Raptor activity, in a putative plant homologue of TORC1, is dispensable for embryonic development but is essential for meristem-driven post-embryonic growth. AtRaptor-independent AtTOR activity in the plant embryo is consistent with the existence of two AtTOR complexes in Arabidopsis: 1) a Raptor-independent complex critical for early embryogenesis (and perhaps all stages of plant development), and 2) a Raptor-dependent complex that is dispensable for embryonic development but which is necessary for post-embryonic, meristem-driven plant growth (Fig. 8B). By identifying the phenotypes resulting from partial and total disruption of AtRaptor activity, we have generated valuable tools for the study of plant TOR signaling. When viewed in the context of previous work on AtTOR [21, 22], our work provides evidence for Raptor-independent TOR activity in land plant embryonic development – development that, notably, occurs in an environment made nutritionally and environmentally stable via maternal input to growth. We propose that in plants as in other eukaryotes there are two (or more) TOR complexes, only one of which involves Raptor. We further propose that the plant homologue of TORC1, involving TOR and Raptor, has been co-opted in plants from its ancestral role in nutrient sensing and cell growth to regulate the highly plastic post-embryonic growth driven by the plant shoot apical meristem. The mutant lines SALK_043920 and SALK_078159, in which Agrobacterium-mediated T-DNA insertions disrupted the AtRaptor1A and AtRaptor1B loci in the Columbia (Col) genetic background, were generated by Joseph R. Ecker and the Salk Institute Genomic Analysis Laboratory (USA) and distributed by the Arabidopsis Biological Resource Center (USA) . Lines were genotyped using the following primers: 1Asm5 5'aaaaagtctcttagatgtagtttcagatg 3' and 1Asm3 5' attcagaatatacaatccaagcattagt 3' to identify the AtRaptor1A wild-type locus; 1Bsm5 5' ctgaccataacattctcttgtaggtaagg 3' and 1Bsm3 5' aggcctgaactctaatgaacaaactctcc 3' to identify the AtRaptor1B wild-type locus; and 1Bsm5 or 1Asm5 and pROK-737 (5' gggaattcactggccgtcgttttacaa 3') to identify the respective AtRaptor mutant alleles. Mutant lines were crossed to Col wild type plants; the AtRaptor1B mutant phenotype cosegregated with the 1B insertion allele in the F2 population. Plants were grown in a greenhouse with supplemental light to 16 hrs, with temperatures held at 22°C days and 17°C nights. Seeds for plate-grown seedlings were surface sterilized with 20% Chlorox, washed in H20, stratified for four days at 4°C and grown on 1/2× MS salts, 0.3% Phytagel under 12 hr. daylight cycles. Buds from Col and insertion line homozygotes were snap-frozen in liquid N2. Total RNA was extracted from 0.3 g of tissue using TRIzol Reagent (Invitrogen) according to manufacturer's instructions. Resuspended RNA was thrice treated with DNA-free™ DNase treatment (Ambion). RNA was quantified with a spectrophotometer. cDNA was generated from 2 μg of total RNA using Omniscript Reverse Transcriptase (Qiagen) and a poly-dT18 primer. PCR was performed using ExTaq polymerase (Takara) in a PTC-100 thermocycler. Primer sequences were as follows: 1A+1828, 5' gctgcgtttattttggctgttattgtc 3' and 1A-2800, 5' ctaggccagccagaggagtgtgagatg 3'; 1B+1379, 5' aggccggcaaaacgatcgtaagacatt 3' and 1B-2774, 5' catcagcccagaggagccaagagg 3'. PCR cycling parameters were 95°C for 5 min followed by 35 cycles of 94°C for 30 sec, 62°C for 30 sec, and 72°C for 1 min. EST clone RZL03b06 corresponding to the 5' end of AtRaptor1B was ordered from Kazusa DNA Research Institute and sequenced (Accession number AY769948). RNA ligase-mediated RACE was performed on total RNA extracted from bulk shoot tissues using a GeneRacer™ Kit (Invitrogen) according to manufacturer's instructions in order to confirm that RZL03b06 represented a full-length clone. Primers were designed to amplify the region from the end of the transcript adjacent to the AtRaptor1B locus to a site within the ORF, spanning a region from 1145 bases upstream of the transcript initiation site through to the sixth exon of the AtRaptor1B transcript. Primers used and restriction sites added are as follows: 1B-8189BglII 5' agatctgaggaaccagaagaaccc 3'; 1B+5104HindIII 5' aagcttcggcggagtaggaaaac 3'. PCR was performed using ExTaq polymerase (Takara) in a PTC-100 thermocycler on Col-0 genomic DNA with the following parameters: 96°C for 5 min, then 35 cycles of 94°C for 30 sec, 60°C for 30 sec and 72°C for 2 min, followed by a final step of 72°C for 10 minutes. HindIII BglII digested fragments of the resulting PCR products were ligated into pCambia1301. Next, the 1301B construct was digested with PmlI and PmeI. The EST containing the AtRaptor1B ORF was digested with PmeI and SmaI, and the resulting fragment was ligated into 1301B to create the complementation vector 1301B:Raptor. 1301B:Raptor was transformed into Agrobacterium line GV3101, and then into Col or 1B-/- plants via floral dip . SEM fixation was performed using standard methods . Bright field microscopy was performed on a Zeiss microscope, and images were collected on a BioRad Confocal System. Digoxigenin-labelled probes were hybridized to paraffin-sectioned material using previously described methods . Locus identifiers were submitted to the Genevestigator Arabidopsis thaliana microarray database and analysis toolbox  at https://www.genevestigator.ethz.ch, where they were assayed against 1434 developmental and tissue-specific Arabidopsis microarray experiment results [35–38]. The authors gratefully acknowledge Barbara Eaglesham for assistance with scanning electron microscopy, Paulina Melechkina for the drawing in Fig. 8 and Nena Alvarez for assistance with in situ hybridization. This work was funded by a fellowship from the National Science Foundation/Department of Energy (DOE)/United States Department of Agriculture (USDA) Training Group in Molecular Mechanisms of Plant Processes to GHA, and USDA Hatch Program and DOE Energy Biosciences (DE-F602-89ER14030) grants to MRH. BV was supported by a Marsden award from the Royal Society of New Zealand and by the New Zealand Foundation for Research Science and Technology. GHA and MRH formulated the experiments, analyzed the data, and wrote the manuscript, GHA obtained the data for the mutant phenotypes, and BV performed the in situ hybridizations.